The Marathon Stick (yellow handles) is softer than any other stick on this page. It's designed for those with very small muscle mass or those who like very gentle massage. Note- if when using this stick you cause it to bend it is not the stick for you & it can result in permanent damage to this model of stick. 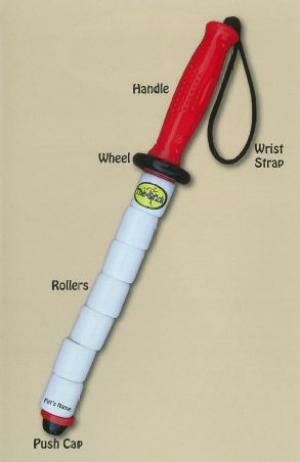 A companion to The Stick, the TriggerWheel features a single nylon wheel with an oval treating surface. It is especially effective in areas too small or too difficult to be reached by The Stick. The FootWheel was developed to soothe tired, achy feet by massage in seconds. By simply rolling back and forth under the foot is gives an excellent foot massage. The miracle of myofascial release makes it a must in the management of plantar fasciitis. The Pet Stick, decreases muscle stiffness and increases range of joint motion; recommended for the symptoms of canine hip dysplasia. The Pet Stick provides a rolling, petting message that creates instant bonding. The Pet Stick is intended for - dogs, cats, and all of your favorite pets. However some athletes are known to prefer this model for use on their calfs!